I’ve caught you up with my day at the Bendigo Sheep And Wool Show, but the real thing is the yarn, right? Well, here’s my yarn haul, just for you! For the most part I’m going to show them in the order that I bought them. I only have one clear favourite, but even then I’m super happy with all the stuff I bought. In some cases I can’t remember where I bought it, so if you were there and happened to see that yarn and remembered the stall, please let me know so I can give due credit and linkies! I had decided that I would try to expand my boundaries and go out of my comfort zone a bit. And you might be rolling your eyes at me. Green yarn? Oh, that’s new and exciting for you, Raynor. But, I really don’t usually buy a lot of 4ply or sock yarns, so it kinda is. 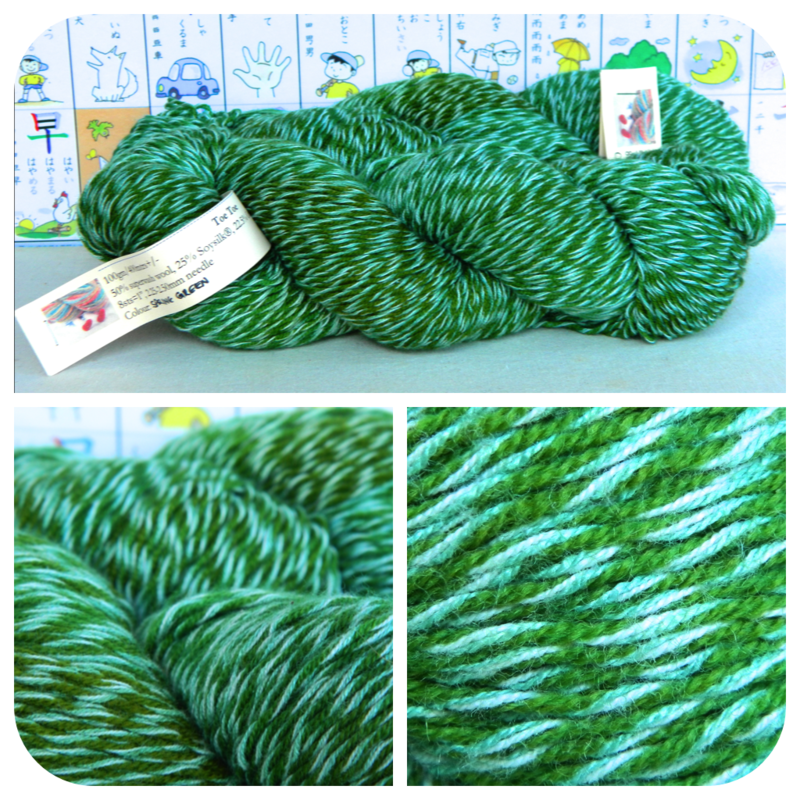 And when the colorway is named “Emerald City”, you’ve gotta forgive me for making serious grabby-hands. I bought this at a little hall that was set up with shops, but it wasn’t in the actual show grounds. 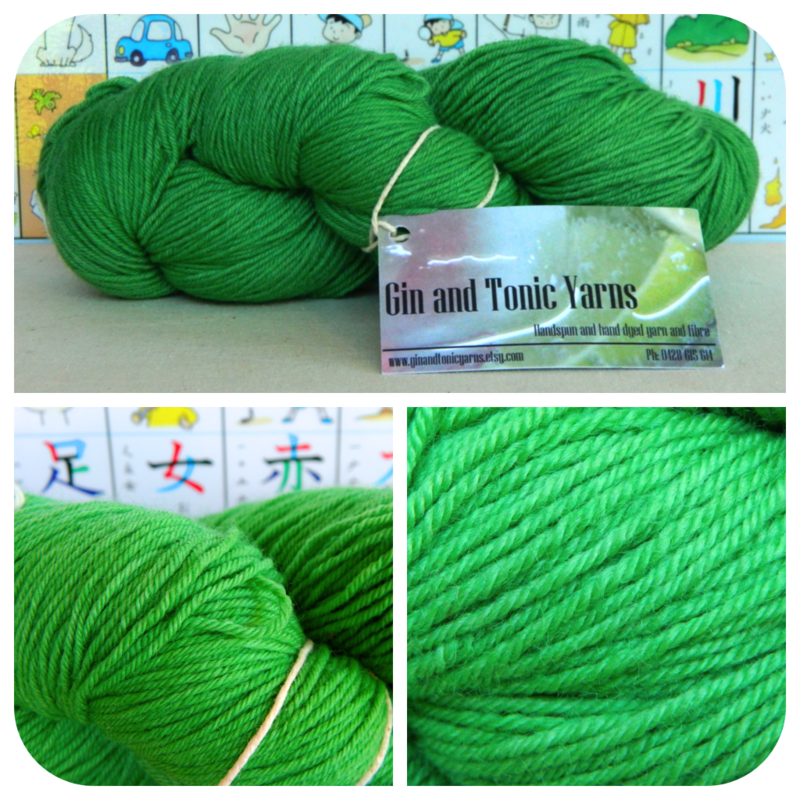 I can’t remember what the hall/set-up was called, but the vendor I bought this from is called Gin and Tonic Yarns. It’s super nice and squishy! I’m not sure what I’ll make with it, because I only got one skein. I’m thinking probably a really simple, light hat for myself. Next, we went to the Bendigo Woollen Mills where I dug around in the back discount room like a cheeky mole. 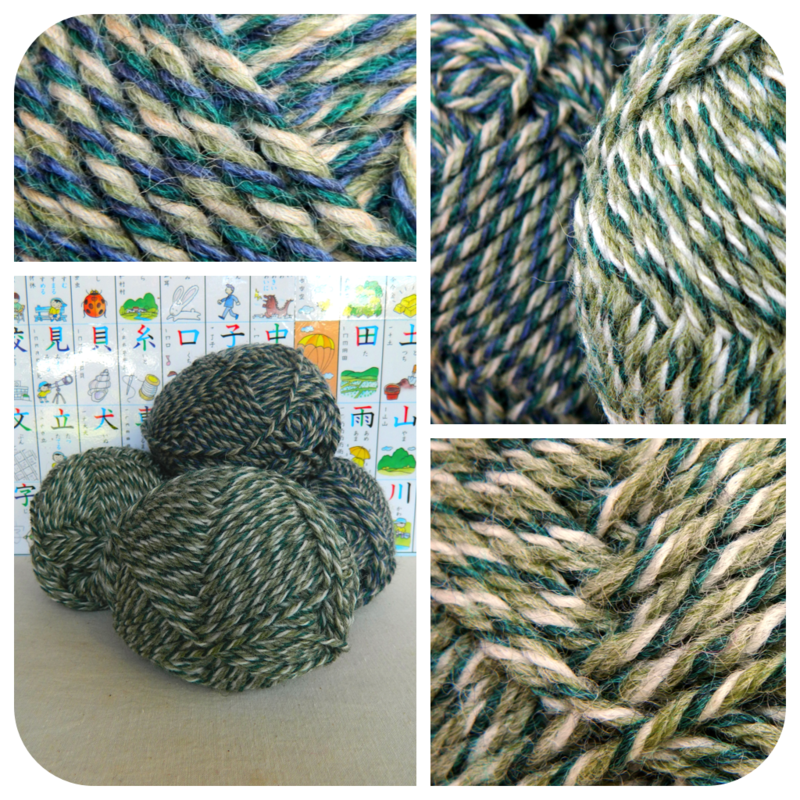 There wasn’t a lot that grabbed my fancy this year, but they did have little bags of this nice twisted color yarn. They were 50g balls of 8ply, 100% wool (I think?) at $2.50 each, so that was pretty decent. Beyond that, I have no idea what they are.I’ll probably use them for amigurumi. Once we got to the actual show, these were the only things I bought on my “preview” lap. They were so cheap and cute that I couldn’t resist. 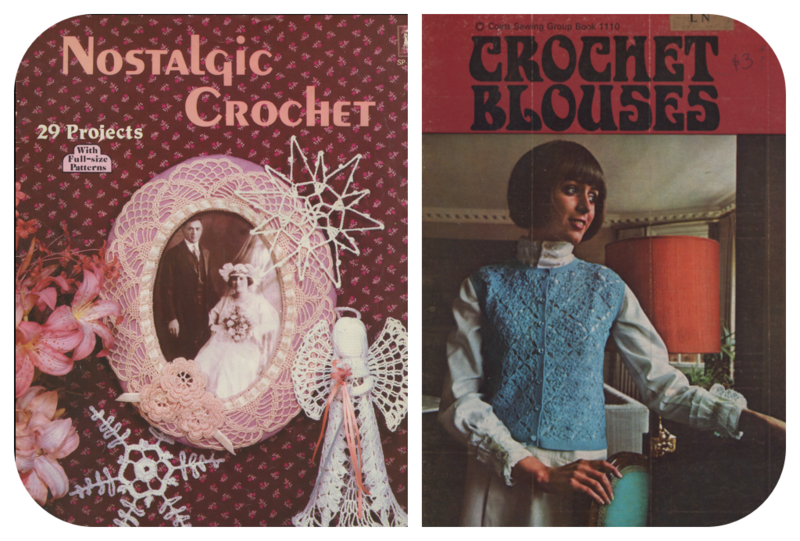 The Nostalgic Crochet one is hilariously kitschy and weird, and since I want to do some fine crochet work this will give me some ideas. The Crochet Blouses one has aged super well. Almost all of the tops in it you could make without any changes and they’d still be totes nice and classy, and not at all dated or naff. It was just a really lovely book. This yarn is the first yarn I bought when I realized that it was almost four o’clock and I was the only one who was still sticking to the “preview lap first, buying lap second” plan. Everyone else was all loaded up and I was empty handed! “Aww, hell naww!” says I and start lapping that show ground like a man on a mission. Because, of course, I was on a mission, gentle reader. A mission to “BUY ALL THE THINGS!”. This yarn is from Kathy’s Fibers, and I adore it. 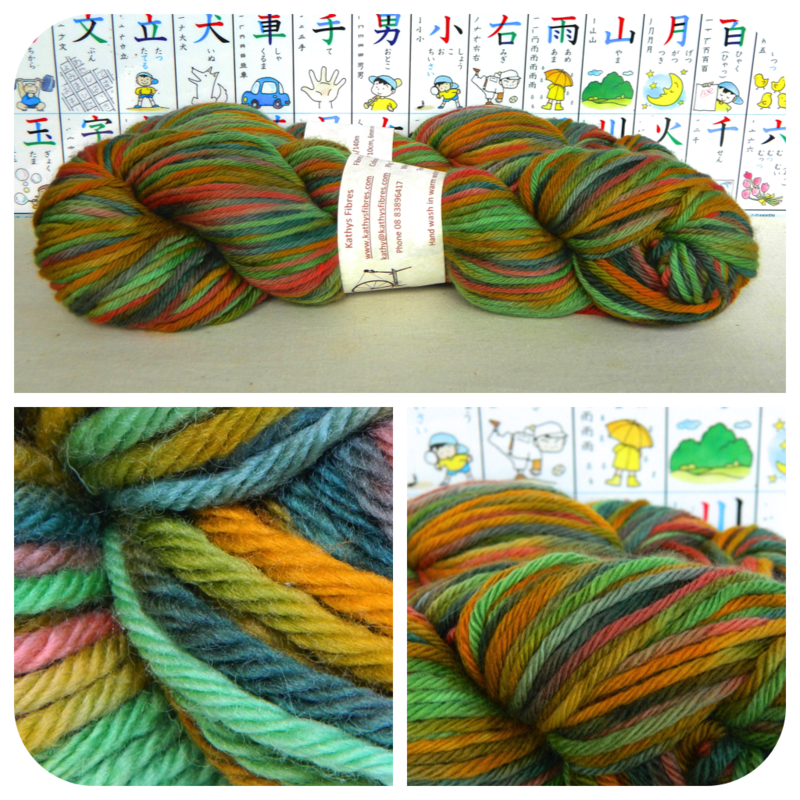 I’m not hugely into variegated yarns usually (at least not for knitting) but I just really loved this one and snapped it up. Again, I’m not sure what I’m going to make with it, but I have two skeins of it so I’m sure I’ll get something super neat out of it. Since I bought some Rowan bamboo tape last year, I’ve been kind of obsessed with tapes. I have no idea what I want to do with any of these tapes, but I love them. I’m not sure which stall it was that I got this from, but the yarn is called Wigwam by Colinette. I love that the colors are bright crisp here, and then a bit muddy there. It’s really soft and smooth and of all the yarns I got, I’ve probably spent the most time squishing this one. Now, I mentioned in my last post that the Stranded in Oz stall was totes my fave, and so is the yarn I bought there. So, we’ve got green and we’ve got a Wizard of Oz reference but to push my comfort zone it’s 4ply sock yarn and it has a really neat fiber blend. 4ply, 50% superwash wool, 25% soy silk, 22.5% cotton, 2.5% chitin. Again, I have two skeins and I’m not sure yet what I’m going to make. I mean, the only thing on my shopping list was a swift which didn’t work out, so all this yarn was a bonus to me and I wasn’t planning on getting much. 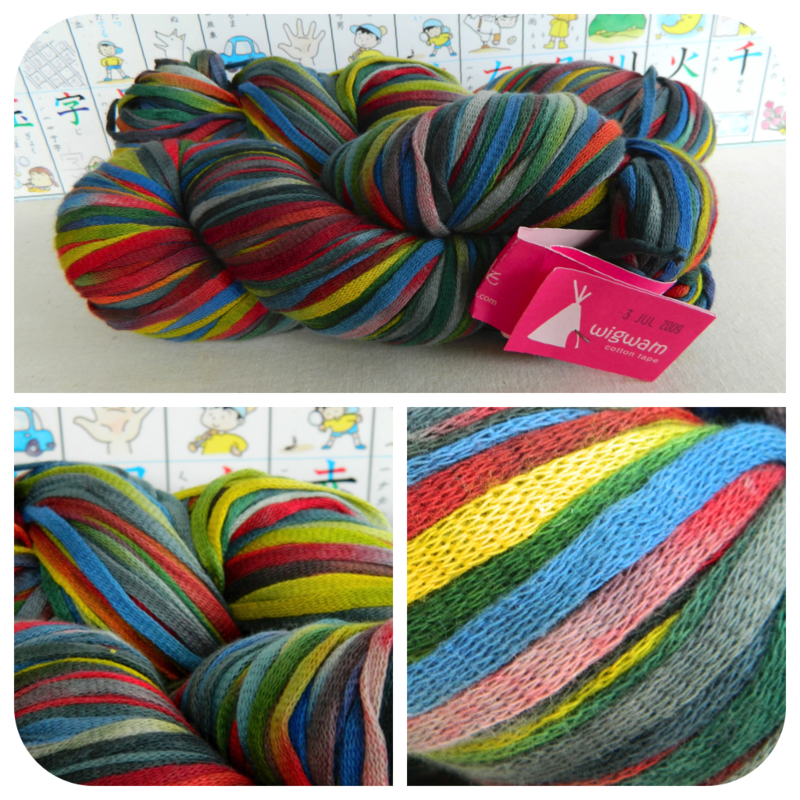 I just adore this yarn though, and I want to make something really special with it. Suggestions? I somehow ended up with these buttons. I think the stall was called the “Button Lady” or something, and had tables full of buttons and some stands with old pattern books. I’d bought a few things there last year, and I really loved that stall. I looked through the buttons and found these. 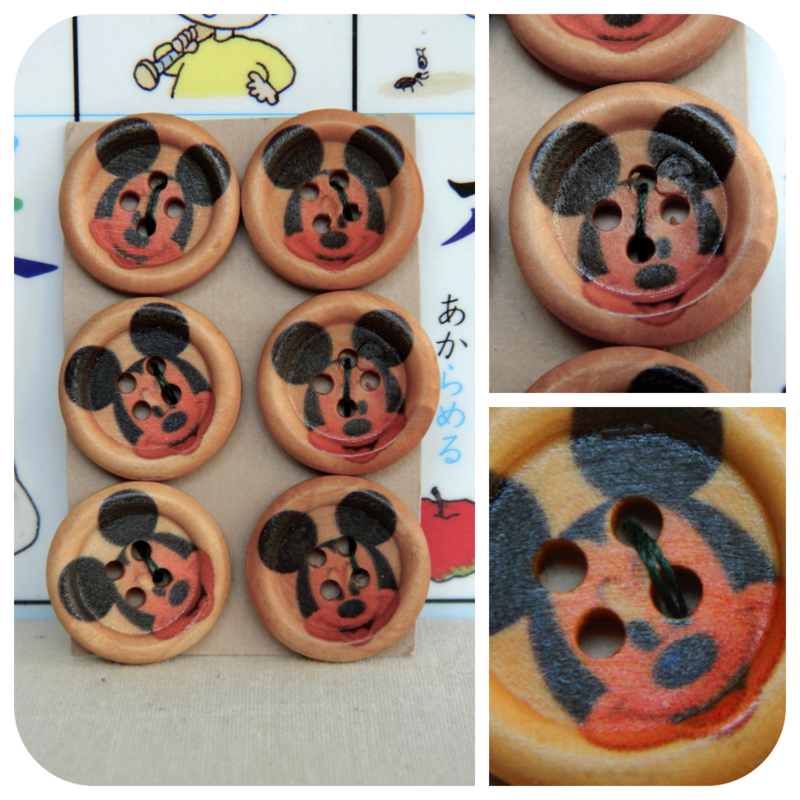 I like wooden buttons, and I like Mickey Mouse so at first I thought this was neat. But they didn’t have the price on them and I didn’t really love them enough to bother asking. I don’t know about you, but I have this weird thing that if stuff isn’t priced I’m not gonna ask, I just won’t buy it. I have to love something a LOT to ask how much it is. I don’t even know what that’s all about. Anyway, Hal – perhaps thinking my reluctance to ask a price was more out of shyness than a bizarre shopping neurosis, bless her – took it upon herself to ask. Meanwhile, I’d decided that they were actually kinda creepy, what with the sewing holes punched through his face, so I’d moved on to patterns. The woman returned, Hal asked on my behalf, to which the woman said that the button card was $6. “Mmm, no thank you,” I declined, thinking the price was perfectly reasonable but the buttons – and Mickey’s repeated facial trauma – were just not for me. “Oh, look. I’m over today. I just bought myself an electric rat trap, so I’m as happy as can be! You can have those buttons. They’re a freebie,” she replied. I looked at Hal, Hal looked at me. The woman turned to another lady and began espousing the merits of electrocuting rats in her new contraption. I decided taking the buttons was the best thing to do at that point. So, that’s my yarn and goodies haul from Bendigo! I’ll keep you posted with whatever I do with them all. Feel free to drop suggestions in the comments or on my Facebook page! 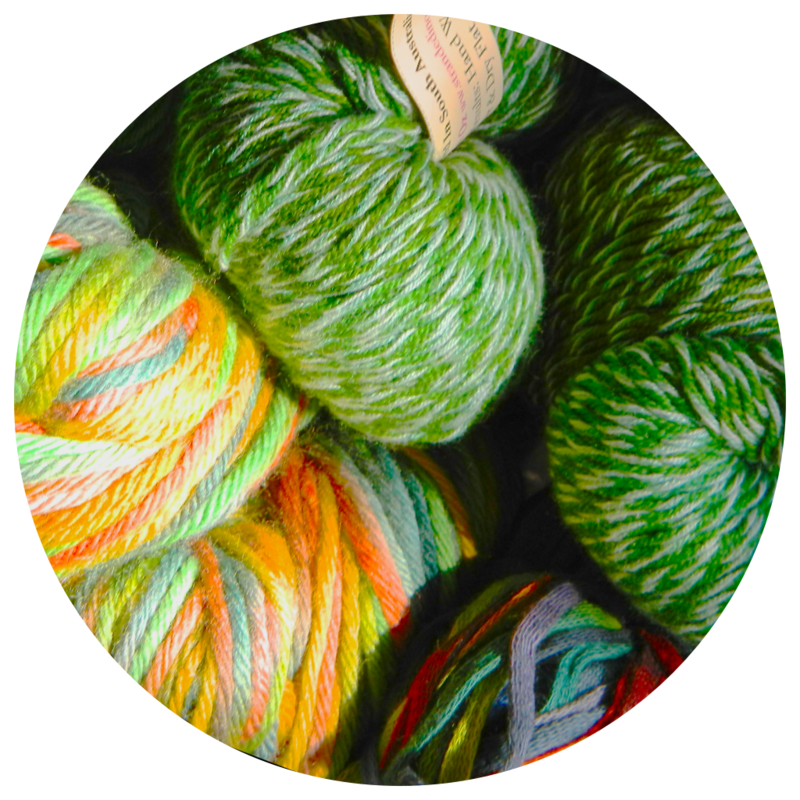 What would you make with these yarns? What are you making with your Bendigo haul? I’m sorry I caused you to go home with creepy Mickey buttons! I’m sort of the same with not wanting to buy things when there’s no prices, but since these were the only ones in the tray without a price, I figured they were clearly just missed, rather than deliberately not priced, which made it different for me. At the first Nanny & Ewe Fiber Muster, held at the North Bendigo Bowls Club (corner of Fenton & Arnold Sts, in case you were wondering). Sounds like they’ll be doing it every year, for anyone who can’t get into Bendi / would prefer to be at the muster. And I think I know which stall you got the Colinette tape yarn at, but I can only remember roughly *where* it was, not what it was called – back right of the first shed/marquee we went into I believe, roughly on the opposite side to the swifts & lovely wooden things stall. Thanks for the info! I’ll update the post later. Oh my goodness, I LOVE THIS POST!!!!! Nothing better to read someone else’s experience of something you experienced too. Especially when it involves wool. I think you did great. I love the green wool the bestest. Best manners ever! Sharing is caring. ^_^ I love your Bendigo snaps! So lovely. I’ve heard of your lovely blog before but hadn’t read it before, as I think happens often in bloggy circles, but I’m so glad I’ve read it now, because it’s amazing! The colinette came from Sarah Durant – http://www.sarahdurrant.com/! I’m sure I’ll find something to do with them. And the lady was pretty lovely, so bless her. every single thing you got is soooooo goood! i would have bought exactly the same things, i’m sure. that tape stuff seems fun. In a splendid example of bad timing, we went to Bendigo 2 days before the wool show started, but I did get a bargain bag of natural cheviot wool from the woollen mills and I’ve started on a vest. I have also noted down the show dates for next year!